Ever want to try something different instead of JUST regular lemonade? Well, here's your shot! 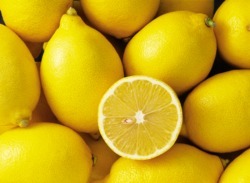 Try the new HONEY-VANILLA LEMONADE that will tickle your senses and will urge you to make more! DirectionsIn a large saucepan, combine the sugar, honey, and 2 cups water and place over medium-high heat. Cut the vanilla bean in 1/2 lengthwise, then, using the back of the knife, scrape the vanilla seeds from the pod and add to the saucepan, along with the pod. Bring the mixture to a boil and cook for 4 or 5 minutes, until the sugar is dissolved and the mixture thickens. Remove from the heat and allow to cool. OR: Try the regular brand.... BORING! DirectionsPlace all the ingredients in a blender and process until completely smooth. Serve over ice. 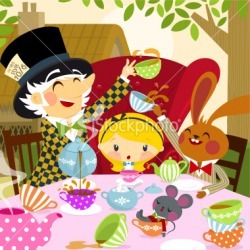 How to Make: A Tea Party! Decide on who is invited. This is very important if your tea party is going to go smoothly. Make the invitations. Ideas like tea pot shaped invitations and put a tag saying 'Read Me' on the paper handle work well. Consider making it a costume party. Use china similar to the following: white plates, tea cups, tea pots (if you're holding the party for a younger sibling or child, you may consider using cheaper dishes in case someone breaks it), and other little things that would go with the setting. On each of the dishes, you could put little tags that say things like "drink me" and "eat me". Serve many little foods and snacks, but you don't need to make them all. Ask your guests to prepare a small tea food and bring it, it will reduce cooking stress and everyone gets to show off their cooking skills! Play some games! Try croquet if you have the materials, or cards! You could also watch the movie. Fill goody bags with things that are connected to the story: cards, roses, tea, etc.